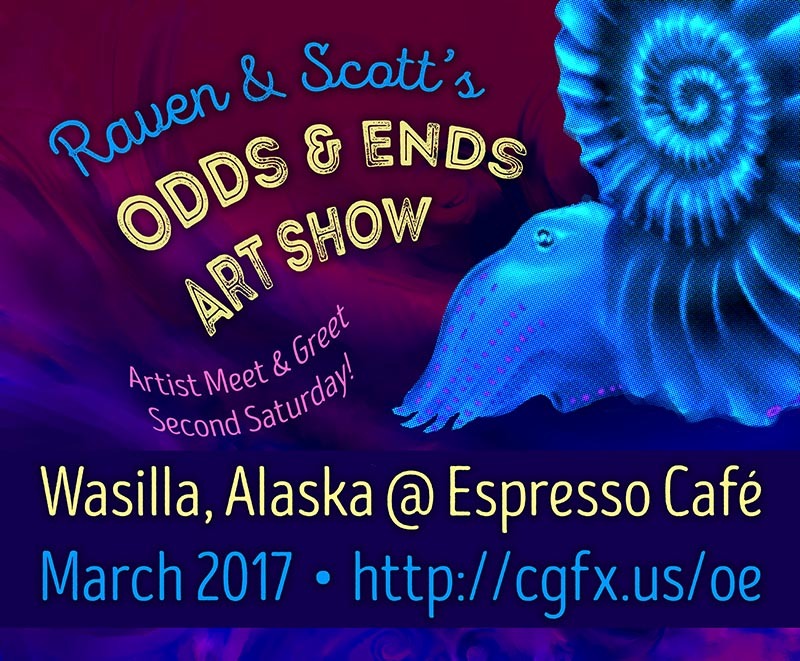 The "Odds & Ends Art Show" continues a 9 year long tradition of artists Raven and Scott that spotlights current scientific understanding about ancient life with bright, imaginative reconstructions of both fossil elements and flesh and blood recreations of prehistoric animals and the environment in which they lived. Through their art, they seek to share their unique vision of deep time with the public, promoting science and a sense of wonder of the creatures that existed long ago. We work primarily in digital format, so creating new art is only half the battle - we need to print our pieces out to share them! This IndieGoGo campaign seeks to cover the printing costs of our new artwork (up to 8 total new works that haven't appeared at our shows before) and hanging supplies - even if we don't reach our total goal, all funds will go into producing the most amazing show we can! Wow, what an amazing and sudden turnaround. We are already funded, and the show will now go on! We still have 17 days left, so any continued donations from this point forward will be used to expand the show even more, including a second run at a different venue later this year—possibly in Anchorage next. An extra special thank you to Jim Wright, both for his generous donation and reshare! More updates will follow, both at the blog here and at the crowdfunding page.